This Tuesday December 28th the Park Street Tavern Jazz Jam welcomes students of JAG’s Jazz Academy and the Columbus Youth Jazz Program for a night of great music. 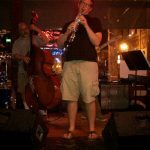 The first set begins at 8:30 pm and features two great guest artists: guitarist Aaron Quinn and drummer James Gaiters, joined by Andy Woodson on bass and Erik Augis on keys. The jam session will feature many of the great musicians involved in the Jazz Academy and CYJP. Join the musicians for a really fun evening of jazz. Snacks provided are provided and there is never a cover charge.